Last month I discussed the features to consider when selecting battery chargers. This month I will focus on the details that will yield a safe and reliable battery charger installation. Installation of a battery charger or inverter/charger (referred to simply as a charger from here onward) requires adherence to two guidelines, those of the charger manufacturer and ABYCs Guideline A-31, Battery Chargers and Inverters. Among these guidelines, chargers should be installed in a location where they will not be exposed to excessive heat (engine rooms are OK but a few inches from an exhaust manifold, for instance, is inadvisable). Additionally, because most inverter/chargers lack ignition protection and because the flammable and caustic fumes emitted by batteries are highly corrosive, battery chargers must not be installed directly over batteries. From a physical security point of view, heavier chargers (especially inverter/chargers) should be through bolted rather than relying on tapping screws for mounting. Whether a charger is through bolted or secured utilizing tapping screws is a matter of both the chargers heft as well as the substrate to which its mounted. Good installation practices and some common sense should prevail; however, when in doubt through bolting is always preferred. Wiring for chargers includes both AC and DC conductors and both must be equipped with the appropriately sized over-current protection (OCP), i.e., a fuse or circuit breaker. For the AC supply, a circuit breaker is typically installed at the main electrical panel. For the DC output, its critically important that it be installed where the chargers output wiring connects to the battery or DC bus, as close as possible to the battery or bus bar. Perhaps the most common error I encounter for battery charger installations centers on OCP, involving the lack of OCP in the DC side of the wiring, or its installed at the charger rather than at the battery/bus bar, or its installed too far from the battery/bus bar. In any of these cases a short circuit could be catastrophic. When fuses or circuit breakers are installed at the charger (most chargers have internal over-current protection for their DC output, however, if they dont then supplemental OCP is required within 7 inches of the chargers DC output cabling) rather than at the battery, the length of cabling between the OCP and the battery is essentially unprotected, yet it may be connected to a large powerful battery bank that is capable of generating significant heat if a short does occur. Therefore, OCP for the chargers DC cabling should be installed as close to the connection with the battery or the vessels DC electrical system as possible. For ABYC compliance, OCP must be installed within 7 wire run inches of the batterys positive terminal, or within 72 inches of the battery if the cable is sheathed over this entire distance, or within 40 inches of a bus bar, battery switch, or other terminal if the cable is sheathing over this entire distance. Remember, the shorter the distance between the power source (the battery in this case) and the OCP the better. The above-mentioned distances are maximums. When AC and DC cables are run parallel to and in contact with each other, the AC conductors should be sheathed, bundled, or if possible, kept separate from the DC conductors. Installations should rely on a DC voltage drop calculation that does not exceed 10 percent (3 percent is preferred); the smaller the cable the greater the voltage drop or loss. Additionally, wiring that enters the charger case must rely on either manufacturer-supplied or installer-sourced strain relief connectors. If you can tug on the wiring, you are in effect pulling on the connections inside the charger, and the strain relief connection is either inadequate or not present. This is critically important, simple chafe protection where the cables enter the charger provide no strain relief. The chassis of the charger must be bonded with a cable that is capable of carrying fault current from the largest positive cable that is connected to the charger. That meanshang on to your hatthe chassis ground needs to be the same size as the DC positive cable supplying the charger. In some cases, its permissible for this cable to be one size smaller than the DC positive cable, but those are limited. This is perhaps the single most common installation violation I encounter on charger and inverter/charger installations. Make no mistake about it, in the event of a short circuit to the chargers chassis, unless the bonding cable is properly sized, it will overheat and may lead to a fire. If you are unable to find a charger with enough output capacity to recharge your house bank in a reasonable period of time, you may need two chargers. However, this isnt as easy as it sounds. Often, when two charge sources are connected to the same battery bank, one will often ratchet back its output as a result of the higher voltage it senses that is being produced by the other charge source (this is often true of alternators and chargers that are connected to the same battery bank as well). In order to avoid this inefficient scenario, use battery chargers that are designed to be interfaced. Mastervolt is one manufacturer that offers such a chargertheir MASS 24/75 and 24/100 series chargers. To be sure, theres no harm in connecting multiple independent chargers to a single battery bank, however, unless they are interfaced you shouldnt expect a combination of their individual maximum output capacity. 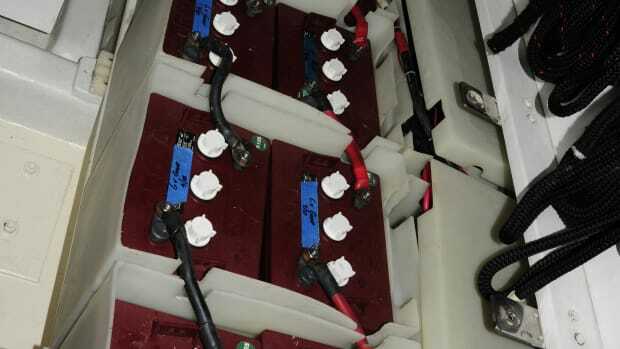 Because warm batteries cannot be charged as quickly as cool batteries, its especially desirable to utilize chargers that can be temperature compensated, particularly if your batteries are of the SVRLA variety, i.e., AGM or gels. Temperature compensation enables chargers to tailor their output for a batterys charge acceptance rate, which is affected by temperature. In the absence of such compensation its very easy to over-charge batteries that are aboard vessels used in warm climates or even for batteries located in (warm) engine rooms. Chronic overcharging invariably leads to shorter lifespan. Choose wisely and then let the manufacturers instructions and ABYCs standards chart your charger installation course and you can be assured of safe, reliable, and efficient performance from batteries and battery charger alike.